Euonymus shrubs provide impressive color to the landscape. They provide lush green foliage throughout spring and summer. In fall, the plants earn their common name of burning bush, as the foliage erupts into a bright red color that's matched by the small berries. Euonymus reaches up to 8 feet tall, making it suitable for hedges. 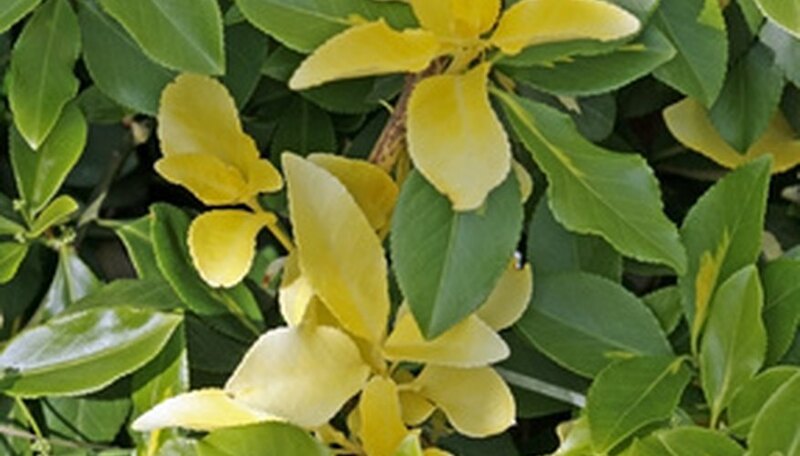 Add more of these vibrant bushes to your landscape by taking cuttings from your existing plants. Euonymus cuttings root easily when they are planted and cared for correctly. Fill a 6-inch diameter pot with a rooting potting mix. Combine three parts peat moss with one part perlite or vermiculite to create your own potting mix. Use a pot that has at least one drainage hole in the bottom. Cut off the top 6 inches of the healthy end of a branch with shears. Choose a branch that is pliable enough to bend and snap, but not so pliable it doesn't break easily. Strip the leaves off the bottom 2 inches of the cutting. Recut the end if necessary so that it is smooth and not jagged or broken. Fill a small bowl with a rooting hormone, available from florists and garden stores. Dip the cut end of the euonymus cutting into the hormone, coating it evenly. Stick the cut end of the cutting into the potting mix just deeply enough so that it stands on its own. Water the potting mix until the excess moisture drains from the bottom of the pot. Insert two or three wooden chopsticks into the soil around the cutting, then place a plastic bag over the pot. The chopsticks prevent the plastic bag from touching the cutting. Set the pot in an area that receives bright, indirect light. Water the potting mix when the surface begins to feel dry, never allowing it to dry completely. Cuttings take root in four to six weeks. Take euonymus cuttings in June before the branches become woody and brittle. Transplant the cuttings outdoors the following spring after all frost danger is past.